I took the two kids on a little Nihola tour before lunch on Sunday. 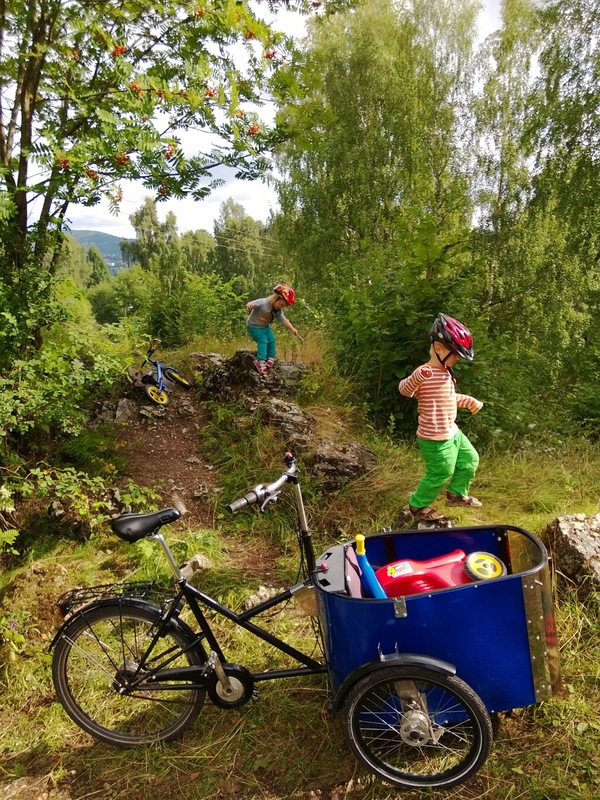 Two kids, a running bike, a plastic trike, snacks, water, spare clothes, rain clothes for everyone, spare footwear for the kids, a saw, a bucket and my usual heavy bike toolkit. Its nice not to wonder how everything will be carried, or what it will weigh. 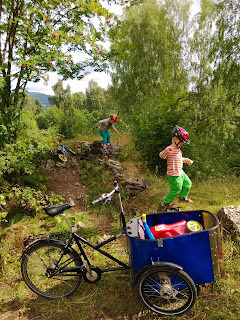 Of course since I'm writing about it, I pondered the weight anyway, which I estimate to be about 45kg of stuff, children included. So off we went without much of a plan. I wanted to go over to the next "mini-valley" (Mærradalen) and have a look at a tree we had seen fallen over across a path. (An excellent opportunity for socially acceptable destruction.) Getting over there means climbing and descending hills. 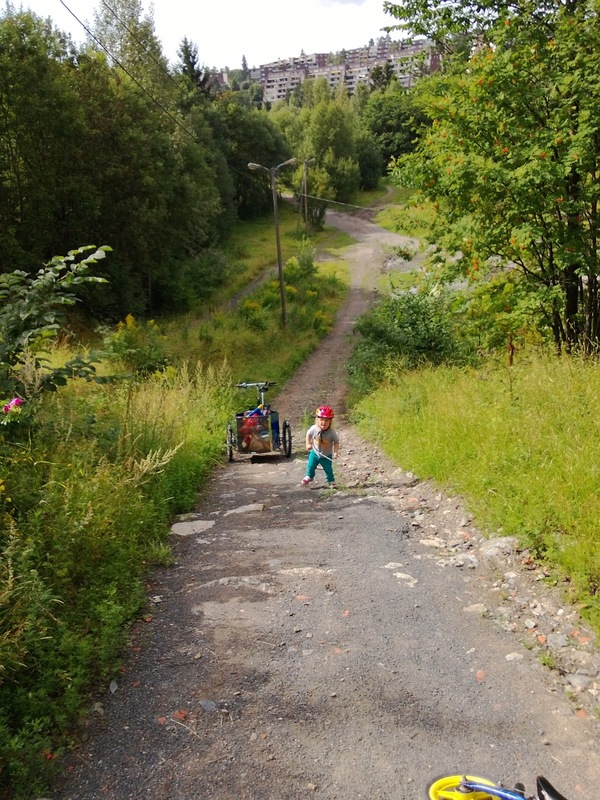 Now, some people have said trikes are no good on hills. That might be true if a person doesn't need to carry anything, and indeed a lot of the bikers in Oslo aren't interested in carrying so much as a fender on their bikes. But I have children, and we're carrying stuff. 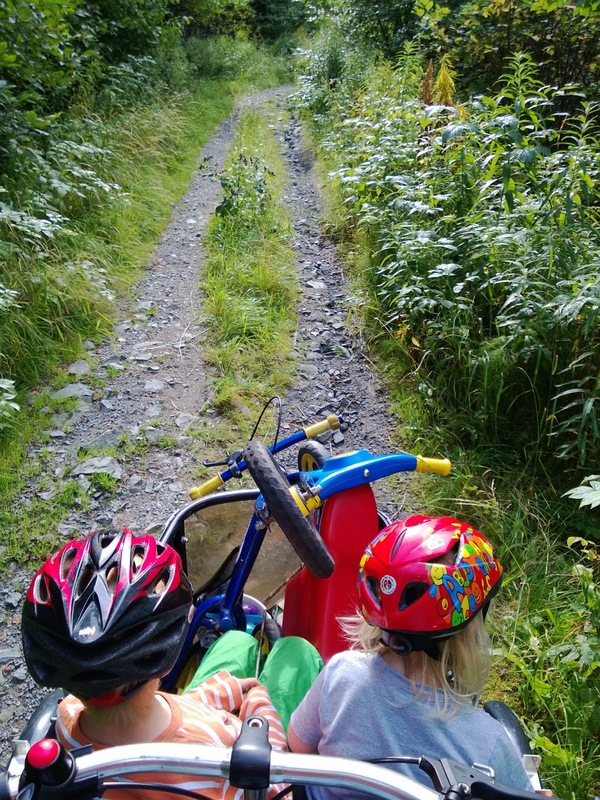 Trikes are awesome on hills. (Awesome in a slow, steady kind of way.) We climbed and descended our way over there. So we went to the tree, cut it apart, and made some little tree swords, which went into the Nihola with everything else. Off we went to the next destination. 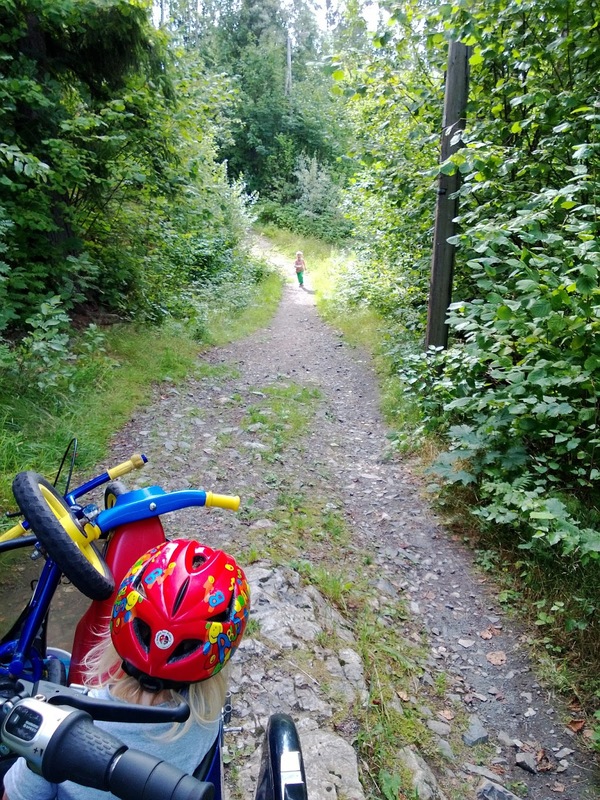 My son spotted a path going off from the main path. 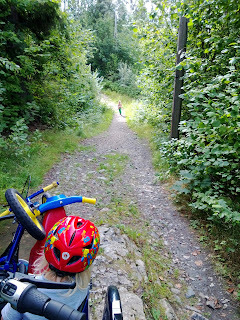 Imagine yourself there on a two-wheeled cargo bike, 45kg of crap in the box, you can either go on the nice wide path, or the smaller one that disappears into the trees, at the bottom of a valley. So we went on the smaller path. Starting a little climb into the unknown. Going back down, with the scout returning to report. The little path had some rocks on it. I didn't think it was so bad, but I did pinch-flat a tube in front, as I later discovered after the patch I applied didn't stop the leaking from the second hole. Thankfully I carry a tire pump. (Obviously, right? Why not.) So the hill got really steep. My son jumped out and pushed. We cleared the first hill, descended a hill, and then came to an even steeper hill. More pushing. This was getting a bit epic, with stalling, coasting backwards, and a slipping rear tire. I got small blisters on my hands, such was the force I applied on the handlebar, while trying to force the pedals around. Then we stopped for a while to pick raspberries and look at big fat brown slugs, before we came to the next hill. As befitting any respectable story, this hill was even steeper, and my son wanted to go up it with the Nihola. So we started. He pushed, I pedalled, and little sister sat in the box. Maybe 1/3 of the way up little sister had to get out. We continued. Maybe 1/2 the way up, I couldn't turn 21 gear-inches on a trike with less than 10kg of stuff in it, and a ~20kg boy pushing. And to be perfectly clear, not being able to turn the cranks on a trike doesn't mean going slow enough to loose balance. It means forward movement is impossible. Scaling the big hill. Finding a place for snack time. So it was then snack time, and we went back home on a mostly paved path. That is the story of our little pre-lunch tour.